Back in April 2016, Fashion Enter proudly announced its partnership with Creative Skillset and the JP Morgan Chase Foundation to continue its skills development training for the fashion and textiles industry at the Fashion Technology Academy (FTA). The training course in stitching and pattern cutting saw 100 individuals, who were not currently in education or training programmes, have an opportunity to gain a real skill which could help them obtain employment or even begin their own design label. The full equipped FTA launched in November 2015 as an extension of the Stitching Academy, and offers a range of qualifications from Levels 1 to 4, covering the entirety of the ‘garment life cycle’. This includes stitching, production and pattern cutting. Fashion Enter is one of the largest training providers of Advanced Apprenticeships at Levels 3 and 4 within Apparel Manufacturing, working with employers such as ASOS.com, Marks & Spencer, River Island, Debenhams, Jigsaw, M and Co and the Arcadia Group. The FTA is the first apparel manufacturing training academy in the country to operate alongside a live Factory and Fashion studio which gives students exposure to real ‘Best of British’ manufacturing skills, whilst training for their accredited qualifications. The FTA was created to ensure the UK apparel manufacturing sector continues to thrive through a new generation of skilled workers. There is no other training provision in the UK today that integrates industry practices with a live, successful factory that currently ranks a ‘leading status’ with the industry acclaimed Fast Forward Audit. Of 360 factories, Fashion Enter is one of two companies that has achieved this fantastic status and reflects the exceptionally high standard that Fashion Enter abides by. 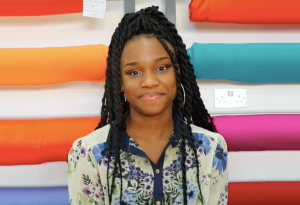 Tehia McDermott, has completed Level 1 of the Stitching Academy course and has been selected to work alongside June Sarpong MBE as an apprentice for her brand, LDNY. 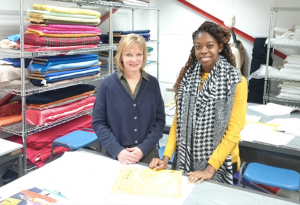 Upon successful completion of the Level 1 Stitching Academy course, Tehia swiftly progressed onto the Level 2 course, which provided her with more advanced skills and knowledge within textiles and production of garments. It was here she successfully made her own shirt and completed modules including tailoring and advanced sewing skills. Keen to use her skills and further her education, Tehia chose to apply for June Sarpong’s LDNY apprenticeship programme, following the launch of Sarpong’s social enterprise foundation which supports young people from London who wish to develop their skills within the creative industry. Following a successful interview, Tehia was chosen as one of the top five candidates and secured a position. After seeing information about the Perfect Patterns Level 1 course on Twitter, Natasha was keen to enrol on the course and, through funding from Tomorrow’s Designers, was able to secure a place. Like many students, Natasha had hopes of what she wanted to learn prior to starting the course and her primary goal was to have a better understanding of how to draft her own patterns in order to create clothing that best fits the needs of individual clients. Following completion of her course, Natasha believes she now has a better understanding of the production process, as well as what clothing will look like from a 2D visual to fitting garments on the body. She now feels more confident in measuring people and creating items people will love.